Anyway, I thought I’d show you the goodies I picked up at the fibre tasting at fibre space on Friday. I went with a plan in mind – Laura Chau at Cosmicpluto Knits released her Honeybee Cardigan pattern recently, and after seeing Jesh’s, well, yeah. It was on my “to-do” list for sure. So, I was planning to look for something to use for that. I also ended up picking up some of the Imperial Stock Ranch yarn that we were playing with at the event, and one of their patterns. 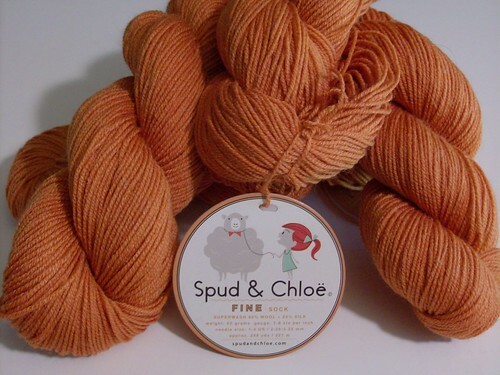 The top yarn is the Spud and Chloe yarn I mentioned the other day – it’s their Fine yarn (80-20 superwash wool/silk sock yarn) in “Clementine”. I think it will work beautifully for the cardigan. 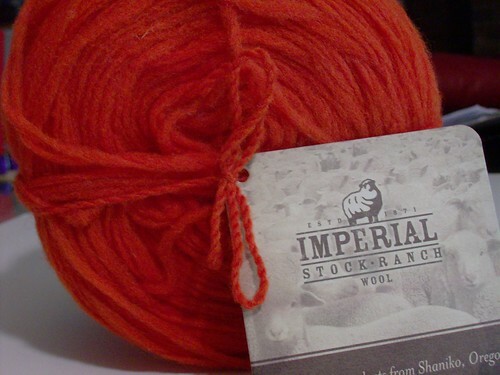 The fiery ball of orange fuzz is Imperial Stock Ranch Bulky 2-Strand. It’s a pencil roving (for my non-knitters, that’s unspun wool), and that color is “Spiced Poppy”. I couldn’t resist it! It’s going to be a Honeycomb Scarf (heh… Honeybee Cardi, Honeycomb Scarf… another pattern there! Didn’t even think about it. ), which is one of the designs that ISR publishes. It’s a neat technique – i-cord linked to itself to form the pattern and then felted. They had one in the shop, and it was just beautiful. I may want to stab my eyes out knitting that much i-cord, but I’m hopeful. 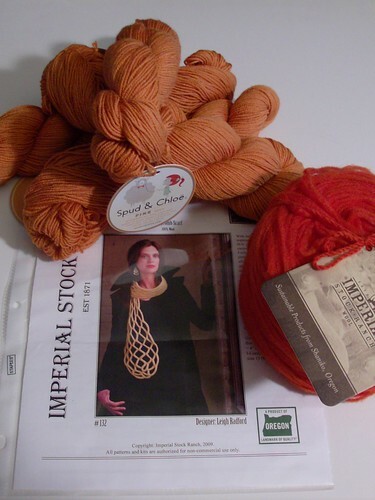 September 22nd, 2009 | Tags: Knitting, Planned Projects | Category: Misc. 9 comments to Orange You Glad I Didn’t Say Banana? I think you should knit the Honeybee Socks (http://www.ravelry.com/patterns/library/honeybee-socks) and wear all three at once. With 4 and 6 year olds in our house, that jokes a staple! LOVE the scarf. Hope you can pull off all that icord – won’t that be great rehearsal knitting? Dude, Turtlegirl Jr. you got enough orange there? Hey now! =P Orange is a wonderful color. But yes, it should all be MINE MINE MINE! And Cristi isn’t even in PA. So you know THREE knitters that are orange-obsessed? That’s a little scary! Oooh, Imperial Stock Ranch itself is even better than the yarn. We have knitting retreats there. On a clear day you can see mountains in Canada from Oregon. I had never been more inspired to work with a yarn before. Hehe..um..yeah, you better hide that from you know who when she visits again 😉 I think she’s spreading orange love, if you didn’t like it before..um..I got some pumpkin orange today in the mail. I love that scarf pattern! And that second orange… I’m neither in Pennsylvania nor a fan of the color orange, but that yarn is seriously beautiful.